Limestone is waterproof, heat resistant and impervious to most scratches and stains once it has been sealed. As a result, most day-to-day care can be accomplished with a damp cloth. Wipe up spills immediately, and wipe down your worktop regularly or mop your floor to pick up dirt and bring up the gloss. Calcium carbonate is often used in indigestion tablets, so it’s certainly not harmful and sealed limestone worktops are food safe, so by all means roll out your pastry on your worktop. However, using a sharp knife on stone isn’t good for either knife or worktop – the knife will blunt more quickly and the stone work top may develop a dull patch as tiny scratches accumulate over time. Lemon juice, vinegar and other mild acids are popular natural cleaners. Here’s why you should never use vinegar on limestone. Limestone is primarily made of calcium carbonate (CaCO3). In its pure form, calcium carbonate is a white solid and it’s found in everything from chalk to marble. If it comes in contact with an acid, such as lemon juice, it splits into a salt (not for eating! ), water and carbon dioxide. Even if you can’t see the reaction, it can quickly dull a high-gloss polish, leave pitting or other marks. Limestone can also be damaged by the strong chemicals in harsh cleaners. Instead of reaching straight for the bleach, start with a damp cloth. Washing up liquid is designed to get rid of grease and food marks, so is a great next step. If you want to bring your stone back to it’s as-new high-gloss finish, a specialist stone polish is key. These are specially formulated to enhance the look of the stone without damaging it. Most people find they don’t need to apply the polish often as the limestone stays looking great without it, but for special occasions you may want to go that extra mile. 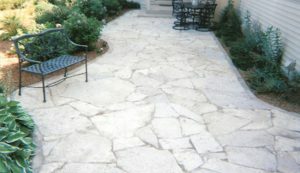 Limestone is a great choice for a patio or garden path. 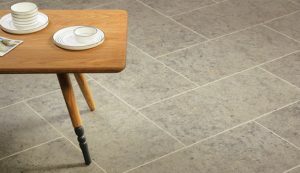 Limestone tiles are often pale, and may become discoloured or dirty, particularly during the winter when they’re less used. Start by sweeping away any build up of dirt and leaves, then use a stiff brush to firmly sweep soapy water across the surface. If this doesn’t have the effect desired, you may wish to hire a pressure washer or use a specialist stone cleaner. If you’ve just moved into a property, you may be dealing with a limestone worktop, floor or tiles that hasn’t been properly cared for. In this case, a specialist cleaning and renovation service may be your best choice as they will have access to specialised cleaning products and equipment that you just can’t buy in the supermarket. If you prefer the DIY route, expect to need several goes at the project as you take layers of dirt off. Start gently, with soap and water and upgrade to a specialist stone cleaner if required. Limestone is unlikely to be damaged by scrubbing but it can be harmed by harsh chemical cleaners.